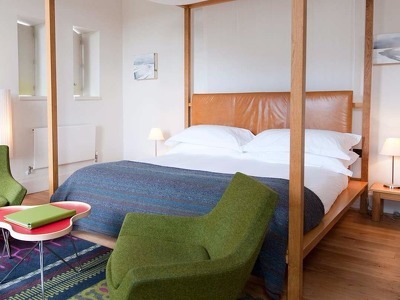 Each of the 30 rooms at Cowley Manor is modern and unique, designed by outstanding British Designers. The en-suite bathrooms are large, light and spacious. Half of the rooms are in the main house with the other half enjoying the privacy of the stable block. 1 king-size bed, sleeping 2 people. Many of the Good Rooms have period features and are located on the 1st and 2nd floor in the Main House. They all have generous en-suite bathrooms with Green & Spring bath and body products, as well as other creature comforts you need for a cosy night away in country. 1 king-size bed, sleeping 2 people. The Better Rooms are located in the Stable Block, with the exception of one located on the 1st floor of the Main House. Some are laid out over two floors and a few over three and all have large en-suite bathrooms. 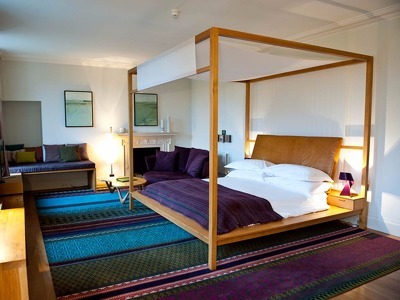 1 king-size bed, sleeping 2 people or twin beds on request. The Great Rooms are in the Main House, apart from one which is located in the Stable Block. Great Rooms are the larger rooms, some with views over the top lake and others that are well suited to small families as some of them can interconnect. The bathrooms are en-suite, large and have full-size Green & Spring products. 2 beds can be added for 2 children upon request for 3 of the Great rooms. Exceptional Rooms are all in the Stable Block and are perfect for families or if you like to have extra space. 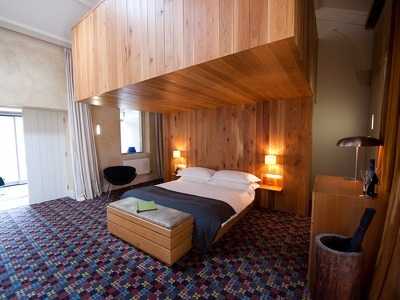 Four of the Exceptional rooms have private sitting rooms with bunk beds and separate ground floor washrooms for kids. The other is open plan with a family sized bathroom. 1 king-size bed, sleeping 2 people. There is only one Exceptional Room and it is, without a doubt, the best in the house. With a four poster bed, a vast en-suite bathroom with a bath for two and large walk-in shower, a large private terrace with gorgeous views over the lakes and countryside, it's the most luxurious and romantic option. The mini bar is also included with your stay in the Best Room. 1 king-size bed, sleeping 2 people. 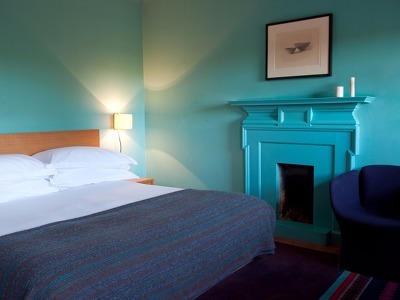 Two Outstanding Rooms are located in the Main House and one in the Stable Block. All of them have large private terraces with either lake or tree top views and large en-suite bathrooms with Green & Spring products. Fabulous Cowley Manor sits in the Cotswold village of Cowley, just under two hour's drive from London and within easy reach of Cheltenham and Cirencester. There is a wonderfully laid-back vibe to the hotel with a real focus on comfort and, surrounded by over 50-acres of rolling parkland, it's a place to really get away from it all. 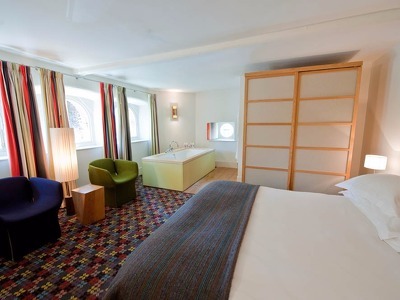 Rooms are very spacious and stylishly designed, featuring bespoke furniture and fabrics from top British designers. The award-winning on-site C-Side spa is a sight to behold with both indoor and outdoor pools and some fantastic treatments on offer - perfect if you're looking to pamper yourself. And the Malt restaurant and bar are incredibly inviting places to retreat to at the end of a hard day's relaxing. 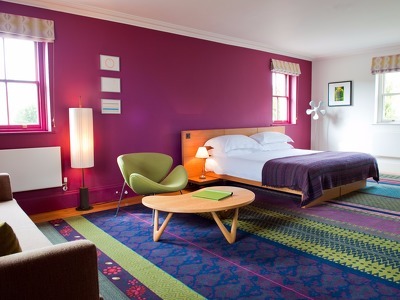 Cowley Manor is very child-friendly with the Exceptional Rooms offering plenty of space for extra beds. There are also lots of games to keep little hands busy and dedicated children's swimming slots at the C-Side pool. There are also a couple of pet-friendly rooms available and the property is available to hire for weddings. Design, location and brand are important but it’s all about service. Luxury is about the service being right, that you don't want for anything - you've got everything you need at your fingertips. You decide you want something, you call and the team here will arrange it for you. It's about the experience that you have that makes you come back and feel that you really understand a place better. That's the trick of travel, the trick of life philosophically – it’s about filling yourself with experiences. Relaxation is the order of the day at Guests have plenty of options during their stay. You may choose to take tea on the beautiful outdoor terrace, relax in a hammock or wander the Grade II-listed grounds. An impressively well-stocked bar is just the place for a cool drink and there are plenty of places throughout to relax and unwind. Cowley Manor is home to the multi-award-winning C-Side Spa which has been cleverly sunk into the landscape and uses its own line of products sourced from sustainable natural resources. You can enjoy some time in the gym, relax with a treatment, swim in one of the heated indoor or outdoor pools or enjoy a session in the sauna or steam rooms. The hotel is close to a number of historic and cultural attractions, including the gorgeous market town of Chipping Camden which is just under 40 minutes' drive away and, of course, Cheltenham. The wood-panelled Malt restaurant at Cowley Manor serves delicious British food for lunch and dinner and there is also a private dining room which seats 14. A new menu has a focus on local and organic ingredients and was created by a team passionate about real food and flavours. Snacks are also available throughout the day at the bar, which also offers a special children's menu. Closest train stations are Kemble and Cheltenham Spa, both with regular service from London Paddington. Our nearest airport is Bristol Airport which is 52 miles and 1 hour drive from Cowley Manor. 15% deposit is required at the time of booking. Please note, when booking our Advance Purchase Rate, full payment is due at time of booking and 100% non-refundable. Cowley Manor operates a 48hr cancellation policy and, even if cancelled within that time, we will always try to resell the room. Should this not be possible, however, we will have to take payment for the first night. Your room will be available from 3pm and check-out time is 12 noon, however if you would like to arrive early and enjoy the facilities, we will be happy to store your luggage until check-in time. We do allow dogs in two of our bedrooms at Cowley Manor, there is a charge of £25.00 per night which includes a bed, water bowl and treat for your pet. Stayed in the standard room and it was well equipped with Bose speakers, high-pressure shower and huge bath with spa products. The main highlight is the heated indoor swimming pool and steam room, which is perfect under this cold weather. Restaurant served high quality food with local ingredients. Will be back. Stunning house with a really impressive spa. The room was amazing with a mezzanine bathroom and separate space overlooking a courtyard. Thoroughly enjoyed a few days here and would 100% return. My wife organised a stay for us at Cowley Manor to celebrate our anniversary and my birthday. Fabulous experience!! Staff are extremely friendly and helpful. We received a complementary upgrade and a small gift. The pool in the spa is beautiful and the treatments are excellent. Had the most incredible time. Thank you! Beautiful building and gardens, excellent space for families with children. Very quiet and green. The service was excellent even though we only there for drinks.